Doggy In Wonderland enjoys traveling with our dogs and we believe you will too with our pet carriers. Whether you are taking a trip, going for a walk or shopping and visiting with friends our dog carriers offer you convenience and style all wrapped up in one! 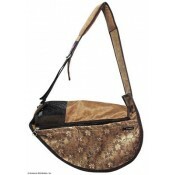 Our fashion dog carriers focus on style while still being convenient for you and comfortable for your little dog. Whether the two of you prefer a messenger style tote that does double duty as a car seat or a Snuggle Sack that allows your pup to snuggle in the lap of luxury our dog carriers offer you a variety of styles and perks that you are sure to be thrilled with. Doggy in Wonderland believes the pet sling Fundle may be the most comfortable, safe and convenient hands free pet carriers that are available on the pet product market. They are specially engineered to fulfill the physical and behavioral needs of your pet so try one today and let us know how you like this dog carrier. Our Pupper\'s purse carriers are simply delightful. Even puppy dogs that don\'t normally like pet carriers tend to love this dog purse because they can snuggle into the soft pillow. This dog purse is worn over your shoulder and so your dog will sit close to your body making him or her feel safer and more secure. When it comes to pet travel, safety first is the motto at Doggy In Wonderland! 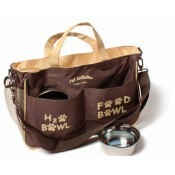 Our travel pet carrier options offer your dog security in being transported to and fro. Some of them even have seat belt loops making these soft sided pet carrier options super safe for car travel. When it comes to traveling with your dog on a plane, you must have an airline pet carrier that is approved. We have a great selection of pet carriers on wheels making them super easy for transport.